Google Launched new payment App for India uses sound to transfer money Named "Tez"
Googles new payment app Named "TEZ" works on any phone with a mic and speaker. 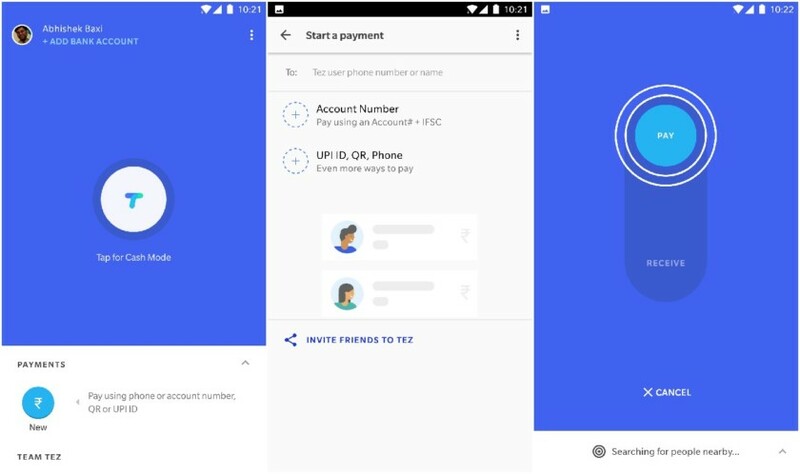 Google has launched a new payment app in India called Tez (the Hindi word for “fast”). Tez features a technology called audio QR that allows users to transfer money using sounds to pair two devices. Called the “cash mode option,” phones negotiate's a connection using audio to identify the payer and payee. (The sounds should be inaudible to human ears though because they’re sent using ultrasonic frequencies, according to the Financial Times.) The feature is similar to cash transactions which don’t require the exchange of personal details like bank accounts and phone numbers. Cash Mode works on any phone containing a mic and speaker and Googles Tez app installed, and doesn’t require an NFC chip. Google’s Audio QR technology is similar to Chirp, which also sends data encoded in ultrasonic audio. There are 300 million smartphone users in India, and phones with NFC are still relatively rare and expensive, with many users instead favoring entry-level and mid-tier devices. Tez is a step beyond Android Pay, because it allows users to link payment apps from Indian banks — it works with all of the country’s 55 banks on India’s Unified Payments Interface (UPI). UPI is a system that allows numerous bank accounts to be linked into one mobile app, and enables secure peer-to-peer payment. According to Bloomberg, digital transactions have surged after the Indian Government banned high-value cash notes late last year.